On the first daily visit to a particular web site, Internet Explorer creates a HOST entry in the INDEX.DAT record. In effect, this entry represents the first visit to a particular HOST on specific day. With further visits to the same web site, the HOST entry remains unchanged. Examining the entries for the Daily INDEX.DAT will show when a web site was first and last visited during the period. Figure 1 below shows an example of this when using the HOST filter view in NetAnalysis to look for visits to the Digital Detective web site. The Last Visited timestamp information is stored as two 64-bit FILETIMES located at offset 0x08 and 0x10 (Decimal 8,16). They are stored as UTC and Local time values. As there is no requirement to alter these timestamps, they are presented in an unaltered state in NetAnalysis as the “Last Visited [UTC]” and “Last Visited [Local]” columns. Figure 2 and 3 summarise these timestamp values. As the URL records contain UTC and Local timestamps, it is possible to establish the Time Zone ActiveBias by establishing the time difference between both timestamps. We discussed in a previous article on manually establish the system Time Zone settings. The calculated ActiveBias information is represented in NetAnalysis by the ActiveBias column as shown in Figure 4. NetAnalysis further uses this information to confirm the selected Time Zone is correct. If the Time Zone ActiveBias is in conflict with the Time Zone setting in NetAnalysis, the resulting timestamps may not be represented accurately. The calculated ActiveBias is logged to the Audit Log as shown in Figure 5. 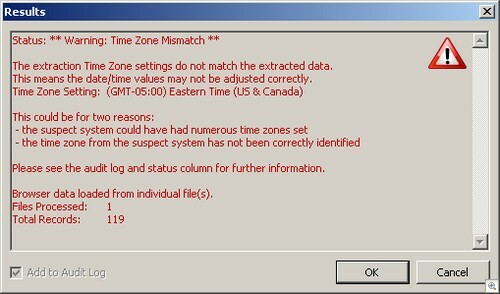 If NetAnalysis detects that the Time Zone settings for the current forensic investigation are not correct, a warning dialogue will be shown immediately after the data has been imported. Figure 4 shows the warning dialogue.